Well, almost 4 months later and a ton of work and I think it's time to scrap cell blending. Heightmaps still work and I will probably keep those, but getting cell blending to look good will take just too much work. Leaving the art style simpler will help preserve the board game feel. Cell borders may get some rounding if I can figure out an easy way. Nope, not scrapping texture blending. Looks much better if the influence radius is set smaller. Screenshots later as I'm working on loading heightmaps from the saved map file. 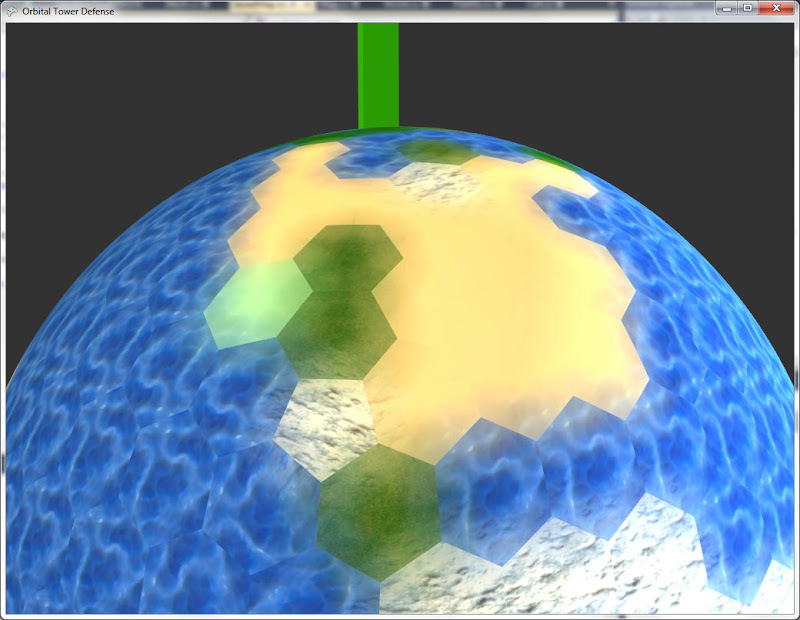 Oceans will have a sandy texture on the grid and a separate inner sphere for the actual water. Being able to check the maximum length of an entity field can be incredibly useful. Later, I'll be exploring how to automatically validate entity lengths, but for the moment we just need to find them. Worry about using them for later post. Entity Framework 4 Data Models, edmx files, provide all the database metadata, but it takes a bit of finding. First, you need a valid ObjectContext. I'm using the Repository/UnitOfWork pattern and my UnitOfWork acts as a wrapper around the ObjectContext that gets passed into the repositories. At the moment the functionality to check length is in the UnitOfWork, but can reasonably be moved anywhere that has access to the database context, such as the repository base. Might make more sense there even. Anyways, to the code. There are several examples around the web and they provided starting points on where to find the correct metadata. In the end, the code is actually quite short. I leave error checking to be handled by the caller. The only errors that should be thrown are if the Context is invalid, ArgumentExceptions if you send an invalid entity, field name, or perhaps most importantly, you try to run this against a non-string type like int or bool. So it would be pretty easy to rework this function to provide any one of those meta values. The TEntity type should be a valid model type tracked by the context, and the field is just a property name. There's probably some fancy-dancy reflection way to eliminate the string here, but I haven't found it yet. Again, placing this in the UnitOfWork might not make the best sense. Perhaps in a Repository which contains an actual ObjectSet would be a bit safer. It should be noted that for other data types, int, bool, floats, etc., different Facets are available, and for some, trying to reference MaxLength will result in an exception being thrown. More information about the actual field type can be found in EntityType.Properties([field]).TypeUsage.EdmType. Greater error checking can, and probably shoud, be put in place.